I love popsicles. I’m sure I’ve sung the praises of popsicles to you before, but let me do it again: real food, homemade, easy, cold, refreshing, and delicious. Am I right? You can make treats you don’t have to feel guilty about. Before you get started with this list, you’ll want to make sure you’ve got some popsicle molds, or at least some paper or plastic cups and popsicles sticks or something else you can use as a holder. Then go popsicle crazy! Popsicles are just frozen stuff, so why not start simple, shall we? 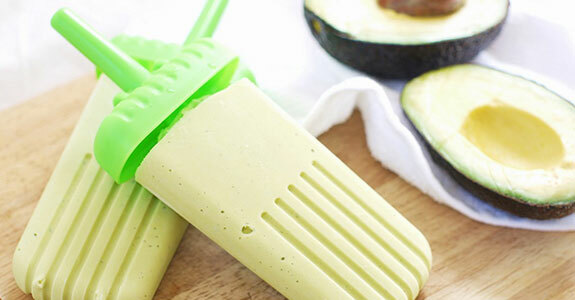 This recipe is for honeydew avocado popsicles, made with a combination of honeydew, avocado, lime juice, a pinch of salt, and honey if you need it. Blend ’em up and pour into popsicle molds. These popsicles are made with cashew milk (you could use any brand or—even better—homemade), semi-sweet chocolate chips, and coconut oil. You’ll first make delicious chocolate popsicles, and then you’ll dip the finished product into melted chocolate. Yum. This list wouldn’t be complete without a tasty Nutella pop now, would it? It’s made from ripe bananas and paleo Nutella, which is healthy and delicious with hazelnuts and chocolate and absolutely no refined sugar, soybean oil, or other junk. Give them a try and you won’t be disappointed. This is an especially kid-friendly pop, too. I don’t know if you’re ever tried balsamic vinegar with fruit before, but it’s delicious. The rich, umami flavor of the vinegar adds a lovely twist to the strawberries in this recipe. Those are two of only three ingredients—the third is honey, and you could also use maple syrup. The chia seeds in this recipe add protein and other great nutrients, while helping the pops with their rich, pudding-like texture. You’ll need almond or coconut milk, maple syrup or honey, dark cocoa powder, bananas (or other sweet fruit), and cacao nibs or chocolate chips. These ice pops are the perfect way to start your morning, and they’re grown-up friendly with a flavor that zings from ginger and isn’t overly sweet. You’ll need fresh orange juice, fresh carrot juice, ginger, and Turmeric Boost or just plain turmeric powder. I’m a huge fan of fruit with herbs, and basil is one of my favorites to use. 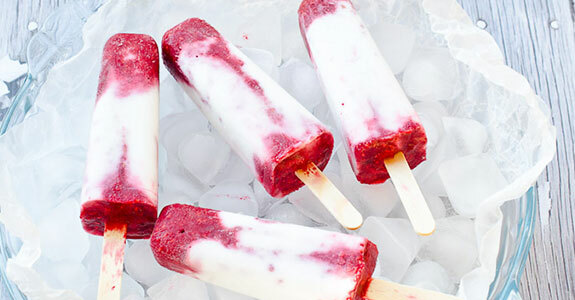 These popsicles are made with strawberries, mixed berries, fresh basil leaves, lemon juice, and optional maple syrup, depending on how sweet your berries are and if you need the extra sweetness. 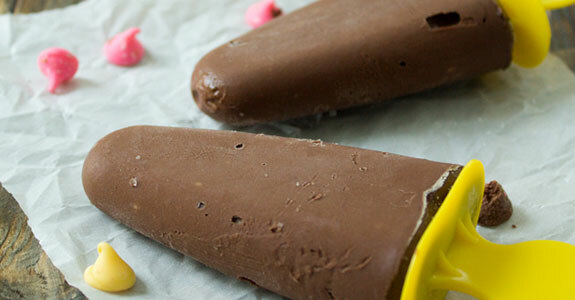 Pudding popsicles conjure up the best memories of those twin pops at the local pool…and not sharing them. Of course, these pudding pops are much healthier than that version, with avocados, cocoa powder, honey, and vanilla coconut milk (or canned). This is one of those popsicles recipes I’ve been meaning to make for ages, but haven’t gotten around to tracking down rose water. I’m so excited for what is definitely a fabulous and elegant flavor combination, along with the smooth and creamy texture. 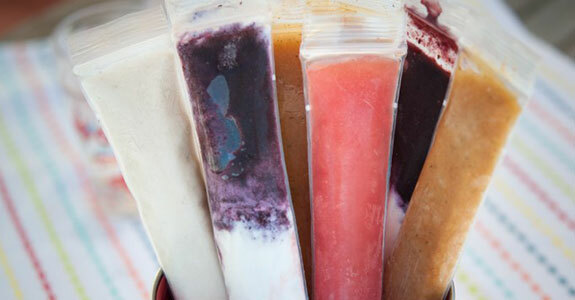 There are a handful of recipes included in this post, which is about the paleo, whole foods version of those colorful, corn syrup plastic tube ice pops you used to love as a kid (remind me why we loved those?). But these recipes, for pops like blackberry orange cream and lavender honey lemon, are amazing. Everything about this recipe is amazing. I love the combination of dark sweet cherries and chocolate, and the combination of chocolate and coffee, and when you put all three together I think I’ve died and gone to popsicle heaven. The vanilla and sea salt are the perfect finish. These elegant pops are for adults only, because they’re made with prosecco. The flavor and color are amazing, with fresh raspberries, honey, mangoes, and a pinch of kosher salt to bring out the flavors. If you don’t have mangoes, I bet peach would be delicious, too. Made with blackberry juice, fresh blackberries, fresh lemon juice, coconut milk, and honey, these popsicles are perfect for a late summer evening. They remind me of picking blackberries as the sun went down in August. So delicious and all real food! Swirly popsicles are my favorite. They’re gorgeous and they look irresistible, these popsicles included. You’ll swirl raspberry and honey puree with full fat coconut milk for a sweet, creamy, and fruity treat you’ll want to eat every day. And they’re healthy, so you can! These grown-up ice pops are made with white grape juice, mint leaves, lime juice, and optional white rum (if you leave out the rum, they’re kid-friendly too). Because they’re very icy and refreshing, they’d be perfect for enjoying on a super hot afternoon. With fresh cherries, sea salt, vanilla extract, cinnamon, and ripe bananas, this flavorful pop takes an a fruity goodness. The recipe calls for cream cheese, but instead, try replacing the cream cheese with coconut yogurt or thick coconut cream. While we’ve used avocado to make pudding pops, we haven’t yet explored how good avocado can taste in a pop on its own. This one is made with coconut milk and fresh lemon juice along with vanilla bean seeds and a bit of raw honey to make them sweet. 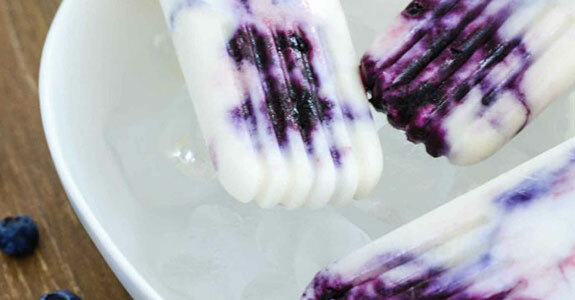 These swirly pops are made with just blueberries (fresh or frozen), maple syrup, coconut milk, and almond milk. The combination of almond and coconut milk keeps the coconut flavor from being too overwhelming, but makes them creamier than almond milk alone would. These margarita popsicles are so good, and so easy. All you need is mango, lime juice, tequila, honey, cayenne pepper, salt, and coconut milk. The recipe explains how to layer the coconut and mango parts to create a beautiful striped popsicle. Some like it sweet, and some like it sour. And lots of people like both! These sweet and tart raspberry lemonade popsicles are perfect, made with frozen raspberries, lemon juice, chia and hemp seeds, coconut milk yogurt, and fresh thyme. And they’re healthy, too! These popsicles are one of my favorites. I love the fancy flavors, too, but I’m also a classic strawberries and cream kind of person. This recipe uses coconut milk, fresh strawberries, raw honey, vanilla extract, and collagen for both nutrition and structure. 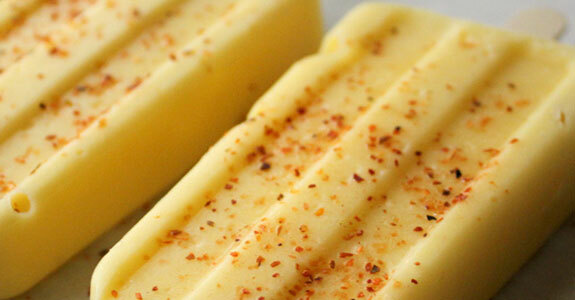 I love mango popsicles, and as a dweller of the American Southwest, I like my mango with chili powder (of course). You’ll need coconut milk, frozen mangoes, lime juice, and chili powder. Mix it all up in a high speed blender and pour into your popsicle molds. Here’s the fancy version of my favorite, and the one recipe I can never resist. You’ll roasted your strawberries up with balsamic vinegar, sweetened with maple syrup, add vanilla, and make them super creamy with canned coconut milk. They’re absolutely divine. Calling all coconut lovers! Coconut is not only the creaming agent in this recipe, but also the start flavor. You’ll need coconut milk, vanilla extract, raw honey, and fresh mature coconut meat or dried flakes (but the meat is the most decadent choice). Gelatin helps add structure. These pops are so easy, you’ll be wondering why you never thought of it (unless you did think of it, then you know how good they are). You’ll need just coconut milk and cream, banana, and fresh diced pineapple. The banana and the pineapple add just the right amount of natural sweetness. 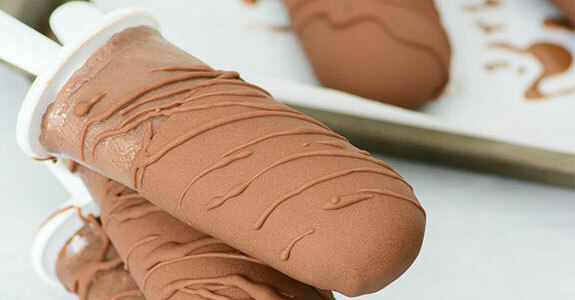 Fudgesicles are so easy to make diary free, and they’re very healthy. If you use an avocado at exactly the right day of ripeness, you won’t even be able to taste it! Just be careful it isn’t overripe, because then the pops will take on that yucky bitter flavor. With fresh pitted cherries, fresh strawberries and blueberries, honey, coconut milk, lime juice, and gelatin, you can be on your way to delicious frozen fruity popsicles. As you can see from the picture, you don’t even really need popsicles molds if you’re in a pinch! Here’s another cherry-rich frozen treat, but this one is made with coconut water and chia seeds for added nutrition. The coconut water is super hydrating, making these pops perfect for hot summer afternoons when everyone is sweaty from running around and having fun. These lassi pops are so tasty I could eat them all day. I make mine with a little twist—replace the coconut milk with coconut yogurt to get that yogurt tang that’s characteristic of traditional lassi drinks. Maple syrup makes these lovely and sweet. 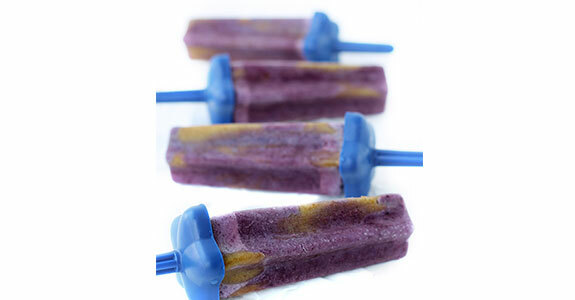 These popsicles are made with fresh or frozen blueberries, coconut milk, and a salted caramel swirl. It’s not the first combination that comes to mind when you think of salted caramel, but it’s so delicious. And this caramel is made with dates! Again with the fruit and herbs, right? They’re so good! This combination of strawberries and fresh torn sage leaves is perfect. 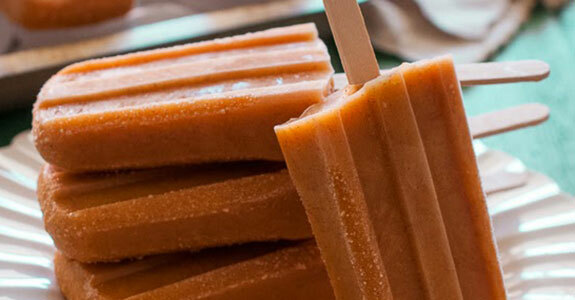 The popsicles are sweetened with a touch of either honey or stevia, if you even feel like you need it. Your strawberries might be sweet enough. This recipe calls for Greek yogurt, but you can easily replace it with coconut yogurt (strained and thick would be best) to make it paleo. The berries and the honey sweeten it up nicely, so make sure you’re using unsweetened coconut yogurt and not the flavored stuff. These creamsicles might remind you of your favorite childhood treat, but they’re much healthier and they have a fantastic striped look with layers of full fat coconut milk and orange juice, sweetened with pure maple syrup and flavored with zest and vanilla. 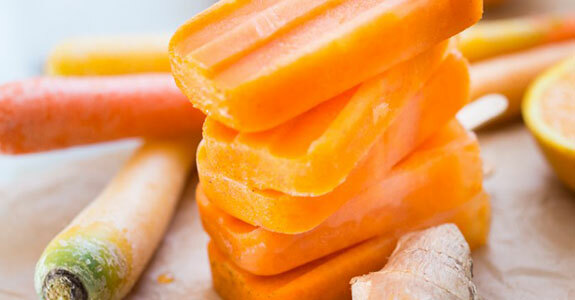 Yes, these are sweet potatoes in a popsicle. And they are amazing. All you need is sweet potato, apple juice, cinnamon, vanilla, and coconut milk (the recipe calls specifically for coconut milk beverage, not canned. You could also use almond milk). Bananas are my very favorite fruit, so I’m pretty excited about this recipe. These pops are creamy and amazing, and super simple to make with just coconut milk, bananas, honey, vanilla, and shredded coconut. If you’re not a huge coconut fan, you can leave that part out. Remember when I said bananas are my favorite fruit? My second favorite fruit is caramelized bananas. Oh, you think that’s the same thing? No, friends, very different. These caramelized bananas pops are absolutely divine, and they have a delicious buttery crunch. Yum! Yes, these popsicles are made with rum, coconut, and lime. They are delicious and sparkly with sparkling water, and fresh mint adds a fresh and herbal flavor, just like your favorite mojito. You’re going to want to try this popsicle—I promise you won’t be disappointed.